Then a new fuselage (but with a similar nose) and vertical fin were developed, married to salvaged and rebuilt (wet) Queen Air wings and horizontal tails, and Twin Bonanza landing gear; this became the SA26 Merlin, more-or-less a pressurized Excalibur. Through successive models (the SA26-T Merlin IIA and SA26-AT Merlin IIB) the engines were changed to Pratt & Whitney Canada PT6 and then Garrett TPE331 turboprops. These were marketed as business aircraft seating eight to ten passengers. An all-new aircraft was built and called the SA226-T Merlin III with new nose, wings, landing gear, cruciform horizontal tail and inverted inlet Garrett engines. Ultimately a stretch of the Merlin III was designed, sized to seat 22 passengers and called the SA226-TC Metro. Because FAA regulations limited an airliner to no more than 19 seats if no flight attendant was to be carried, the aircraft was optimized for that number of passengers. The standard engines offered were two TPE331-3UW turboprops driving three-bladed propellers. A corporate version called the SA226-AT Merlin IVA was also marketed and initially sales of this version were roughly double that of the Metro. Prototype construction of the Metro began in 1968 and first flight was on August 26, 1969. Swearingen Aircraft encountered financial difficulties at this stage, and late in 1971 Fairchild (which was marketing the Metro and building its wings and engine nacelles), bought 90% of Swearingen and the company was renamed Swearingen Aviation Corporation. It was at this point that the previously cash-strapped company was able to put the Metro into production. In 1974, the original Metro models were replaced by the SA226-TC Metro II after about 20 Metros and about 30 Merlin IVAs had been built. Among the changes made were larger, squared-oval windows and optional provision for a small Rocket-Assisted Take Off (RATO) rocket in the tail cone, this being offered to improve takeoff performance out of "hot & high" airfields in the event of an engine failure. The Metro and Metro II were limited to a maximum weight of 12,500 pounds (5,670 kg) in the USA and countries using imperial units, and 5,700 kgs in countries using SI units. When this restriction was lifted the Metro II was re-certified as the Metro IIA in 1980 with a maximum weight of 13,100 pounds (5,941 kg) and the Metro II's TPE331-3 engines replaced by -10 engines of increased power. The SA227-AC Metro III was next, also initially certified in 1980 at up to 14,000 pounds (6,350 kg) this increasing to 14,500 pounds (6,577 kg) as engines and structures were upgraded. An option to go as high as 16,000 pounds (7,257 kg) was offered. Externally, improvements incorporated into the Metro III were a 10 ft (3.05 m) increase in wing span, four-bladed props, redesigned "quick-access" engine cowlings and numerous drag-reducing airframe modifications, including landing gear doors that close after the gear is extended. Once again a corporate version was offered as the Merlin IVC (the model name was chosen to align with the contemporaneous short-fuselage Merlin IIIC). A version with strengthened floors and the high gross weight option was offered as a cargo aircraft known as the Expediter. Both the Expediter and the Merlin IVC were designated the SA227-AT. Finally, due to reliability problems with Garrett engines in the second half of the 1980s, the Metro IIIA was offered with two Pratt & Whitney Canada PT6A-45R turboprops in place of the Garrett units; however none were actually delivered. A special model was the SA227-BC Metro III built for Mexican airline AeroLitoral, which took delivery of 15 of the 18 of this model that were produced. Improvements beyond the Metro III provided better systems, more power and a further increase in takeoff weight. This design effort resulted in the SA227 CC (for Commuter Category) and SA227-DC models, initially called the Metro IV then renamed Metro 23, so named as they were designed for certification under FAR Part 23 (Amendment 34) standards. A Metro 23 EF with an external pod under the lower fuselage for greater baggage capacity was also offered as well as an Expediter 23 and Merlin 23. The SA227-CC was an interim model with TPE331-11U engines and only a handful were built. In the 1960s Swearingen Aircraft developed a prototype SA-28T eight-seat jet aircraft with a flapless delta wing. It shared the tail and cockpit with the Merlin/Metro. The two engines were to be Garrett TFE731 turbofans then in development; they were originally to be mounted on the aft fuselage, however during the course of design work their location was moved to under the high-mounted wing. Early flights were to be undertaken with General Electric CJ610 engines fitted. Development continued after Fairchild acquired the company, but the project was shut down nine weeks from first flight. It was later cut up as scrap and the fuselage used as a Metro display at trade shows. At the 1987 Paris Air Show, Fairchild released details of proposed developments of the Metro designated the Metro V and Metro VI. These versions would have featured a longer fuselage with a taller "stand-up" cabin providing 69 in (180 cm) of interior height for passengers; a redesigned, longer wing; engines moved further out on the wing from the fuselage; a "T-tail" and various system improvements. A Merlin V corporate version of the Metro V was also planned. The Metro V was to be fitted with the same engines as the Metro 23 and the Metro VI was to be fitted with more powerful TPE331-14 engines. The Metro VI was shelved within months of being announced due to a lack of customer interest, but Fairchild did not proceed with the Metro V either. One version that did see the light of day was the Metro 25, which featured an increased passenger capacity of 25 at the expense of the baggage space found in earlier models; the deletion of the left rear cargo door and the addition of a passenger door on the right-hand rear fuselage; and a belly pod for baggage. A Metro III was converted as a Metro 25 demonstrator, it flew in this configuration in October 1989. Also mooted but not built was the Metro 25J, which would have been another jet-powered aircraft with TFE731s in over-wing pods. The type certificates for Metro and Merlin aircraft are currently held by M7 Aerospace. Two of the original Metro model were delivered in 1972 to Societe Miniere de Bakwanga (MIBA) in Kinshasa, Zaire, the first customer to put the Metro into service. The first airline to put them into service was Commuter Airlines in January 1973, followed shortly after by Air Wisconsin. At least one Metro IIA flies in Canada with Perimeter Aviation. Two SA227-CCs are today registered with Canadian operator Bearskin Lake Air Service Ltd., while another two are operating in New Zealand. A fifth also flew with Bearskin Airlines but was destroyed in a mid-air collision in 1995. In service with Perimeter Aviation in Canada, this long-term operator of the Metro II made a number of modifications to suit its use in northern and remote Canadian sites where rudimentary gravel "strips" were common. Some of the many innovative changes to the design of the Metro allowed the aircraft to fly more efficiently as well as cutting down on the "noise factor" that was attributed to the early models. The airline installed Garrett engines with quieter and more efficient four-bladed Hartzell propellers. Their Metros are also all equipped with modern avionics suites including certified AlliedSignal KLN 90B GPS. Many of the improvements resulting in the Metro 23 came about during work to produce the military C-26B model for the United States Air Force. In civilian service the type has proved to be popular, with sales in the 19-seat airliner market rivalled only by the Beechcraft 1900. It is especially popular in Australia. Since the first example (a Merlin IVA) arrived in 1975, almost 20% of the fleet has operated in that country. As of December 2008, 61 Metros and Expediters are registered in Australia, more than all of its market rivals combined. Metro production ended in 1998, however by this time Regional Jets were in vogue and turboprop types were out of favour with airlines, and several airframes remained unsold at the factory. The final aircraft, Metro 23 c/n DC-904B, was not delivered (to air charter company National Jet Aviation Services of Zelienople, Pennsylvania) until 2001. A total of 703 Metro, Expediter, Merlin IV series and C-26 series aircraft were built. In addition, 158 other SA226 and SA227 series aircraft were built as short-fuselage Merlin IIIs, IIIAs and IIIBs. Picture - VH-KDO, a Metro 23 of Australian regional airline Regional Express (REX). The REX Metros have since been sold or transferred to subsidiary company Pel-Air. Tp88 - Metro III (one aircraft) delivered to the Swedish Air Force for use as a VIP transport. Some 55 other airlines also operate smaller numbers of the type. On 12 June 1980, a Metro II operating as Air Wisconsin Flight 965 suffered engine failure following massive water ingestion during a thunderstorm; the crew lost control and crashed near Valley, Nebraska. Both crew members and 11 passengers died; two passengers survived with serious injuries. On January 19, 1988, a Fairchild Metro III operating as Trans-Colorado Airlines Flight 2286 under the Continental Express brand, crashed near Bayfield, Colorado. Both crew members and seven of the 15 passengers died. Of the surviving passengers, only one was uninjured. On 8 February 1988, a Metro III operating as Nx�rnberger Flugdienst Flight 108 suffered a lightning strike, following which the electrical system failed. The right wing separated from the aircraft during an uncontrolled descent and the aircraft disintegrated and crashed near Kettwig, Germany. Both crew members and all 19 passengers died. 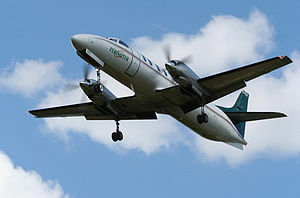 On September 26, 1989, Skylink Airlines Flight 070, a Fairchild Metro III was on a scheduled flight from Vancouver(YVR) to Terrace (YXT), British Columbia with two pilots and five passengers on board. The aircraft crashed one quarter mile to the west of Terrace Airport while the crew was attempting to carry out a missed approach in IFR conditions. The aircraft was destroyed by the impact and a post-crash fire. All seven occupants were fatally injured in the crash. On February 1, 1991, SkyWest Airlines Flight 5569, operated with a Metro III, collided with USAir Flight 1493, resulting in the death of the 10 passengers and two crew members on board the Metro. On June 18, 1998, Propair Flight 420, a Metro II flying from Dorval International Airport (now Montreal-Trudeau International Airport) to Peterborough Airport in Peterborough, Ontario, experienced a wing/engine fire during the initial climb. It attempted an emergency landing at Mirabel, but crashed near the runway threshold, in part due to a landing gear failure. The two pilots and the nine passengers on board were killed. On May 3, 2005, a Metro III operating a cargo flight as Airwork Flight 23 broke up in midair and crashed near Stratford, New Zealand. Both crew members died. On May 7, 2005, a Transair Metro 23 crashed near Lockhart River, north of Cooktown, Queensland in Australia. A total of 15 people died in what is, as of December 2009, the worst airline crash in Australia since the 1960s. On November 5, 2010, a LC Busre's Fairchild Metro III, N115GS, performed an emergency landing at Alf�rez FAP David Figueroa Fernandini Airport (Huanuco, Peru) when its rear landing gear failed to extend. All passengers and crew were uninjured. On November 13, 2010, 15:34 PM, a LC Busre's Fairchild Metro III, N7-810, crashed when landing at the Andahuaylas Airport (Andahuaylas, Peru); two people were injured. A landing gear malfunction contributed to the crash. On 10 February 2011, Manx2 Flight 7100, on a flight from Belfast, Northern Ireland to Cork, Ireland, crashed on landing in fog, resulting in the death of six people. Donald, David, general editor. Encyclopedia of World Aircraft. Etobicoke, ON: Prospero Books, 1997. ISBN 1-85605-375-X. Endes, Gx�nter. "Fairchild (Swearingen) Metro/Merlin". The Illustrated Directory of Modern Commercial Aircraft. St. Paul, Minnesota: MBI Publishing Company, 2001. ISBN 0-7603-1125-0. Simpson, R.W. Airlife's General Aviation. Shrewsbury, UK: Airlife Publishing, 1991. ISBN 1-85310-104-X.